The Bulls lost to that team? No, really, that Charlotte team? At home? By double figures? The Charlotte team whose lottery pick in the Bulls’ Friday 105-75 rout has more names than he had field goals? Whose sixth man shot zero for nine and whose perimeter shooting stretch four was one of 12? That Charlotte team beat the Bulls in Chicago by 10 in December? If there was something going around, it was perhaps relief after the Bulls’ one sided loss to Miami Thursday. 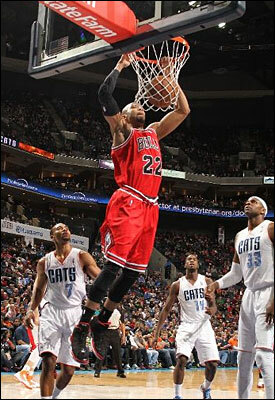 The Bobcats invitingly allowed the Bulls’ players plenty of movement without facing obstacles, like bodies. They backed up so Bulls players could see teammates cutting and didn’t have to thread and needle those passes. They generously spread out so the lane was pleasantly open for strolls toward the rim, and they were kind enough to keep their hands down so as not to block the Bulls’ players vision during their shots at the basket. Sadly, no one called Bulls high scorer Taj Gibson with 17 points “Sir,” and no one delivered any of the seven other Bulls players scoring in double figures some home made preserves to take on their journey, next stop Oklahoma City 8:30 Sunday night. But it was Southern hospitality nonetheless, and a much needed visit for the Bulls after Thursday’s national TV smackdown. It helps, of course, when the Bobcats discipline Ben Gordon, the former Bull whose play in a three and four-guard lineup in Chicago Dec. 31 enabled the Bobcats to break an 18-game losing streak. Gordon had a run in with coach Mike Dunlap earlier this month, the team failed to trade him and he’s apparently out of the rotation along with former Bulls teammate Tyrus Thomas, who didn’t even make the active list. In fact, the three highest paid Bobcats, Gordon, Thomas and DeSagana Diop didn’t play. Dunlap said he is building a core of young players. Though it’s difficult to say whether they are the apple of his eye now or just a rotten core. Kemba Walker led with 27 points, though 19 in the second half after the Bobcats had fallen behind by 20. Owner Michael Jordan sat near the bench and you can understand why he apparently believes he still can play. The Bulls couldn’t be happier as they scored more than 100 points for the second time this month and first time in a win. More impressively, the Bulls had an altruistic 37 assists on 42 baskets, a season high in assists and one below the league high for the season established by the Spurs. The Bulls moved to 32-23, two games behind second place Indiana in the Eastern Conference. “I thought we played a great team game and we needed this game after last night,” said Luol Deng, who had 14 points and was two of three on three pointers. “I thought we didn’t play well at all last night. It feels good just to get a win. We’ve just got to keep it moving. Woody Allen said 80 percent of success was showing up, though based on my high school career it’s closer to 65 percent. Unlike Thursday’s home loss, the Bulls this time arrived with purpose. Hinrich was out again, as he was in that New Year’s eve loss when Noah had the flu and finished with two points. But the Bulls went inside with the ball, which is always the theory if not the practice, and Carlos Boozer with 10 points, 10 rebounds and four assists set up Noah before Noah began later running the offense from the high post in something of a tribute to the late Johnny Kerr. Noah picked apart the Bobcats defense, which generously failed to adjust and kept laying off with the theory you let Noah shoot. It makes sense except if he’s playmaking, Noah the league’s premier big man passer along with Memphis’ Marc Gasol. And without Hinrich the options are limited as the Bulls moved Nate Robinson off the ball more while Marquis Teague remains scoring oriented. 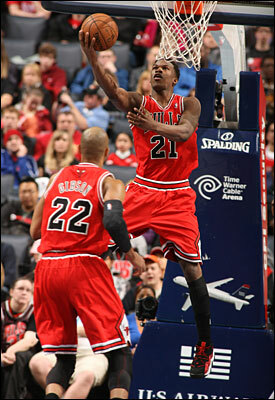 Though Teague was one of seven Bulls with at least four assists. It was nice to know Thibodeau didn’t demonstrate any dance steps. This time it was the opponent with the hot potato ball handling as the Bobcats had four turnovers in fewer than four minutes to open the game while the Bulls would finish with six turnovers after 27 Thursday night, though the Bobcats would graciously not try to take the ball away much. The Bulls were ahead 16-6 less than eight minutes into the game, and to get an idea how this one went after Gibson opened the second quarter with a free throw the Bulls led by double figures the rest of the game. This is also how it went early: Boozer, who basically was left out of the offense in the first half Thursday, was a focal point to start Friday. He spun by Bismack Biyombo with a slick move and followed that falling away with a jumper that he was fouled on. That’s right: They let him go inside for the layup, the Bulls with a 52-34 edge in the paint, and fouled him fading away from 18 feet. Actually, it was just one, from Marco Belinelli, with 12 points, five rebounds and five assists, second most to Noah. That was part of a 16-4 run to open the second quarter that had Dunlap calling a pair of timeouts less than four minutes into the quarter as his players, standing around, seemed secretly to be applauding the Bulls passing with the Bulls accumulating an assist on every basket in the second quarter. I assume that at least tied a league record. From there, the Bulls had, as they like to say, fun. Belinelli on the break had a look away pass to Boozer, who was fouled going in and by halftime the Bobcats barely got above 30 percent shooting in trailing 51-37. “Those guys just know where they are supposed to be,” said Walker of the Bulls on defense, a somewhat unfamiliar concept to the Bobcats. Charlotte plays a lot of isolation on offense with their guard oriented, dribble offense. Everyone but Noah played fewer than 30 minutes, and Noah was just enjoying himself, rousing the scattered audience late in the third quarter with the Bulls ahead 73-57 when he casually began a ball handling exhibition during a stoppage of play with several between the legs dribbles as he mimed a one-man fast break. Noah was a maestro the first half of the fourth quarter, finding Jimmy Butler on a back cut, Belinelli for a three and good buddy Gibson, who started the fourth making three straight jump shots before Magic Belinelli found Butler streaking downcourt with a Hail Mary outlet for a three-point play. Deng closed the third with a three to put the Bulls ahead 78-57, and Butler capped the evening’s fun for the Bulls with a one handed slam dunk on a perfect lob pass from Belinelli. As the game wound down, former Most Every Team Nazr Mohammed drew a technical foul against one of his former teams, taking exception to another of their kids deciding to be aggressive down 28. The Bulls now get a look at those wacky kids in Oklahoma City who beat the Bulls by double digits the last time those teams played. But given the Thunder is the league’s highest scoring team and the Bobcats are tied for 28th, this one might be somewhat more difficult, sort of like watching Kendrick Perkins try a drop step. Though it should be interesting.